(e) whether a letter has been written to Chief Secretaries of States and UT Governments in this regard and if so, the details thereof and the timeframe fixed for implementing the procedure of appraisal? (a) to (c): Review of performance of Government servants is an ongoing process under Fundamental Rule 56(j) and Rule 48 of Central Civil Services (Pension) Rules, 1972, which provide that the performance of a Government servant on attaining a specified age or qualifying years of service is to be reviewed and he/she can be retired in public interest.The instructions on the procedure to be adopted and various aspects to be kept in view while conducting periodical review under provisions of the said rules have been issued from time to time. 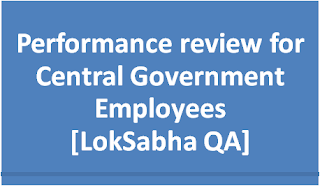 (d) and (e): Confidential Rolls (CRs) / Performance Appraisal Reports (PARs) of IAS officers are written for each financial year or as may be specified by the Government in the form and as per the schedule prescribed in the All India Services (Performance Appraisal Report) Rules, 2007.The appraisal form of IAS officers, inter alia, provides for comments on the overall quality of officers including areas of strength and his attitude towards weaker sections.